Egypt’s unstable Muslim Brotherhood regime, voted into power on an anti-US and anti-Israel platform, is to receive 20 F-16 fighter jets. Egypt’s increasingly unstable Muslim Brotherhood regime, voted into power on an anti-US and anti-Israel platform, is about to receive 20 F-16 fighters jets despite calls to suspend arms sales to Cairo, Fox News reported Tuesday. The jets were ordered by deposed Egyptian President Hosni Mubarak, and the Muslim Brotherhood is about to take over the inheritance. Egyptian President Mohammed Morsi, swept into power earlier this year on an Islamic campaign that promised reforms, has turned the Arab Spring revolution on its end by trying to usurp power. He has deployed armed soldiers and police to quell angry riots that have raised fears of a repeat of the violent suppression of anti-Mubarak protesters nearly two years ago. Despite the instability, the United States is going ahead with the delivery of the F-16 jets, part of a two-year-old order for the planes. The first four jets are to be delivered January 22, according to a source at the Texas air base where the planes are being tested. The date, by coincidence, is the same day that Israelis will vote for the next Knesset. 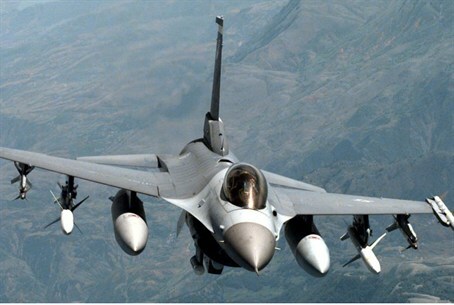 Fox noted that Egypt already has 200 F-16 warplanes and quoted Malou Innocent, a foreign policy analyst at the Cato Institute, as saying that the timing of the deliveries is more than questionable, but not because of the Israeli elections. “Should an overreaction [by Egypt] spiral into a broader conflict between Egypt and Israel, such a scenario would put U.S. officials in an embarrassing position of having supplied massive amounts of military hardware … to both belligerents,” he said. Morsi has backed off his attempt to assume dictatorial powers, but he is trying to win approval of a new constitution that would place Islamic Sharia law in a more prominent place in Egypt. "The Morsi-led Muslim Brotherhood government has not proven to be a partner for democracy as they had promised, given the recent attempted power grab," a senior Republican congressional aide told FoxNews.com. The order for the Lockheed-Martin planes is another win for the American military-industrial complex. "This is a great day for Lockheed Martin and a testament to the enduring partnership and commitment we have made to the government of Egypt," said John Larson, vice president, Lockheed Martin F-16 programs. Pentagon spokesman Lt. Col. Wesley Miller explained to Fox, "The U.S.-Egypt defense relationship has served as the cornerstone of our broader strategic partnership for over thirty years. The delivery of the first set of F-16s in January 2013 reflects the U.S. commitment to supporting the Egyptian military's modernization efforts. Egyptian acquisition of F-16s will increase our militaries' interoperability, and enhance Egypt's capacity to contribute to regional mission sets." President Barack Obama had distanced himself from the Muslim Brotherhood until it became clear that it was a driving force following the fall of Mubarak. In a radical shift of foreign policy, Obama’s advisors, some of whom support a more liberal policy towards Hamas, began making contacts with the Muslim Brotherhood and eventually established open contacts with the radical Islamic party. It campaigned on a strongly anti-American and anti-Israeli platform, but the U.S. State Department has reasoned that Egypt will remain an ally. State Department official Andrew J. Shapiro was cited as stating last month, “I know that the uncertainty over the Egyptian transition has prompted some in Congress to propose conditioning our security assistance to Egypt. “The administration believes that putting conditions on our assistance to Egypt is the wrong approach, and Secretary Clinton has made this point strongly. Egypt is a pivotal country in the Middle East and a long-time partner of the United States.